IP Result of anti-BRD8 (IP:10476-1-AP, 4ug; Detection:10476-1-AP 1:300) with HeLa cells lysate 1200ug. 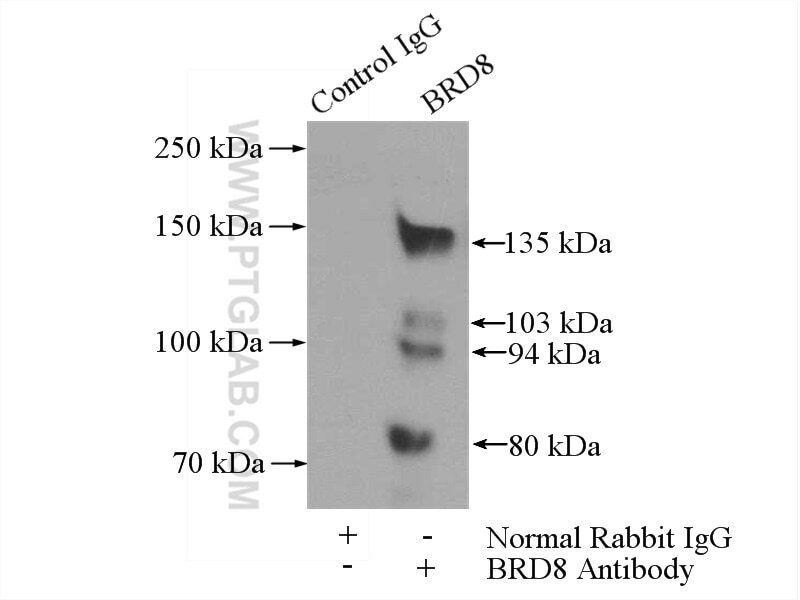 BRD8 is one of the bromodomain-containing proteins, which is an acetylated lysine- binding domain and thought to be involved in regulation of protein acetylation and/or HAT (histone acetyl transferase) activity [PMID: 12963728]. It is also reported to be an accessory subunit of NuA4 HAT complex (also known as TRRAP/TIP60 complex) through biochemical purification [PMID: 16049979]. In addition, it can bind to thyroid hormone receptor-ß and/or retinoid X receptor, and can act as a coactivator of the nuclear hormone receptor-mediated transcription in reporter assays [PMID: 10517671].